LOS ANGELES - June 14, 2016 - PRLog -- The next indie thriller from Seasons & a Muse Productions and the award-winning producers of "The Scarapist,"™ which comes to VOD and DVD later this year, launched its crowdfunding campaign on Indiegogo earlier this month and is going strong. "Night Rain" marks the second feature from actress, screenwriter, producer and director Jeanne Marie Spicuzza. 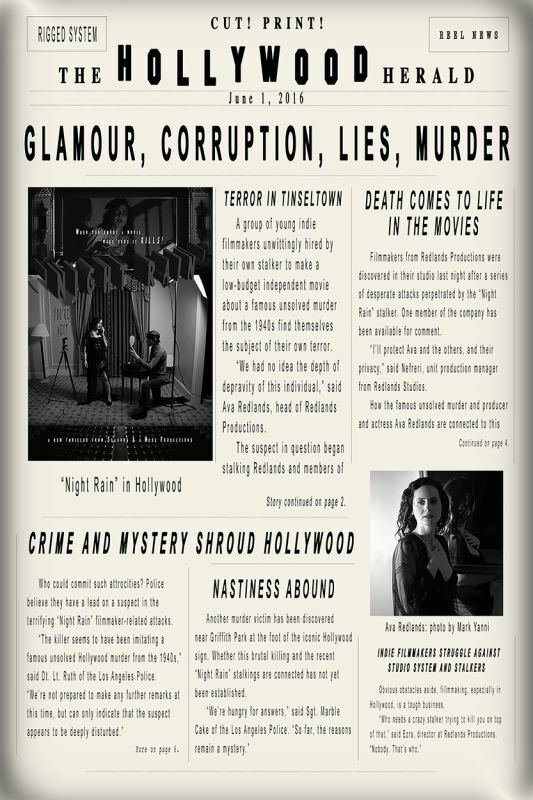 Packed with exciting perks and opportunities fashioned after the great icons of Hollywood film history, the "Night Rain" campaign has already secured over 60% of its campaign total. "Night Rain" is the story of a group of young indie filmmakers, headed by an actress and producer named Ava, played by Spicuzza, who are unwittingly hired by their own stalker to make a movie about a famous unsolved Hollywood murder from the 1940s, but soon find themselves the subject of their own terror. Like "The Scarapist,"™ "Night Rain" is based on actual events. "'Night Rain' is inspired by survivors and victims of violence, particularly women, and an homage to the Golden Age of Hollywood and indie filmmaking," said Spicuzza. "It's the first time in cinema history that this victim will be humanized, rather than humiliated, and portrayed authentically, from the feminine perspective." Other cast and crew include Spicuzza's husband, drummer Guy Hoffman of Violent Femmes and BoDeans, R. Michael Gull, Massimiliano Trevis, Synthian Sharp, Jessaymn Prince and more to be announced. Visit https://igg.me/at/nightrainmovie for more details. "The support [for "Night Rain"] has been overwhelming," said Spicuzza. "The title comes from my granddaughter, Amaya, whose name means 'Night Rain' in Japanese." "Night Rain" is slated to shoot in Los Angeles in fall of 2016.
: SEASONS & A MUSE, INC.